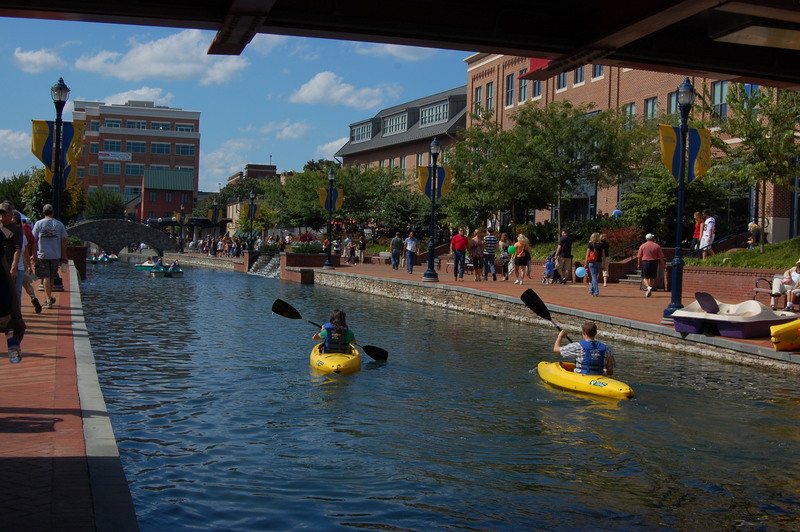 The Improved Carroll Creek: What’s Next for Frederick? The first time I visited Frederick, Maryland I was already hunting for an apartment downtown. I had never even set foot in the city, but had already decided that I would 100% be moving more than a thousand miles to live there. How was I so sure? I had seen so many photos of the charming historic town and, well, it looked like a real-life Stars Hollow. 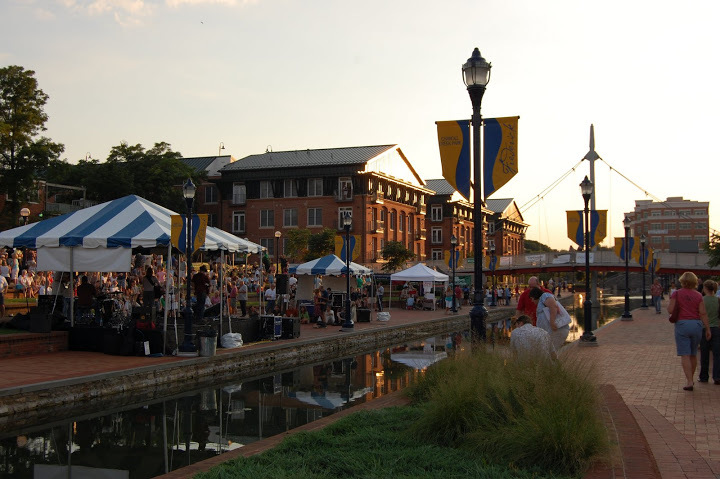 When I finally saw Frederick in person, it was Carroll Creek that really cinched the deal. We happened to be in town on a Thursday in summer, which meant there was a band playing at the amphitheater and tons of people walking, hanging out and enjoying themselves on a beautiful summer evening. You may have noticed that Carroll Creek is in the process of getting some upgrades. There’s construction in several spots along the creek. I can’t be the only one curious about it, so I got permission from the City of Frederick to post some artist renderings of the project. First let’s take a look at the map of the Creek. It runs from Baker Park past East Patrick Street. Currently most of the Creek from Baker Park to almost East Street is developed. With the new phase, the developed creek will be almost 1 mile long. There’s some work being done on the south side of the creek between West Patrick Street and Market Street (more on that at the end of the post). However, the bulk of the new construction is on the east side, particularly from East Street to E. Patrick Street. Check out this artist rendering looking East from the bridge over East Street toward McCutcheons! 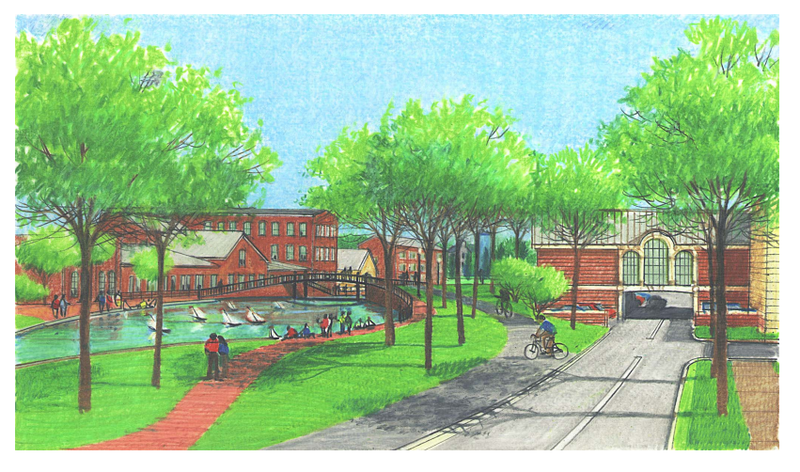 This artist rendering is from a 2003 draft park plan of the Carroll Creek Park Project. It does not represent the actual plans. Source City of Frederick. Here’s a more detailed plan of this portion of the project – bridges, fountains, paths, landscaping and seating. From a 2008 Carroll Creek Park Briefing document. Source: City of Frederick. Some more features from a 2003 plan on this portion include a kayak and paddleboat marina. I don’t know if these are still part of this phase of the project, but if so that would be a great addition to the creek. 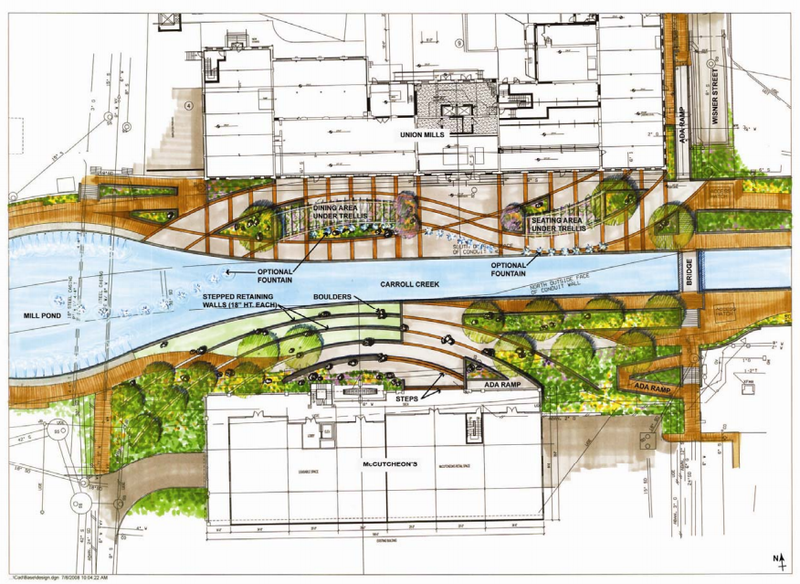 From a 2003 draft park plan of the Carroll Creek Park Project. Source City of Frederick. If you’re curious about the status of the project, the City’s Economic Development group is blogging regular updates of the construction in progress with lots of photos. 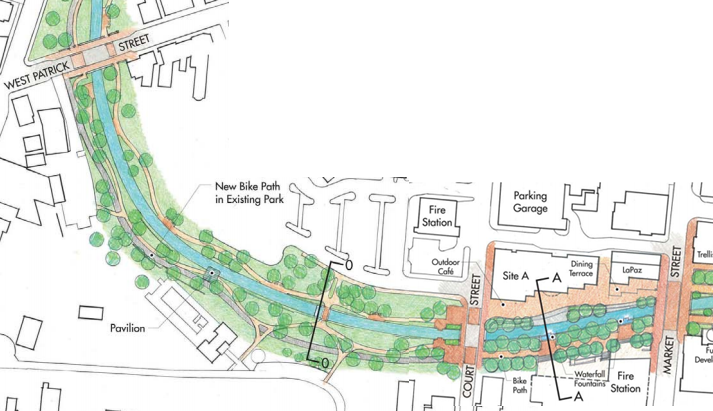 Here’s a few plans for the other portions of the creek that are part of this phase. Below is a plan from the work being done on the south side of the creek to the west of Market Street. The City is also working on finishing up the creek from the Delaplaine (40 S. Carroll Street) to East Street. Here’s an artist rendering of looking at East Street (in the direction of the train station) from approximately the Delaplaine. Can’t wait to share actual photos of the project after its completion! 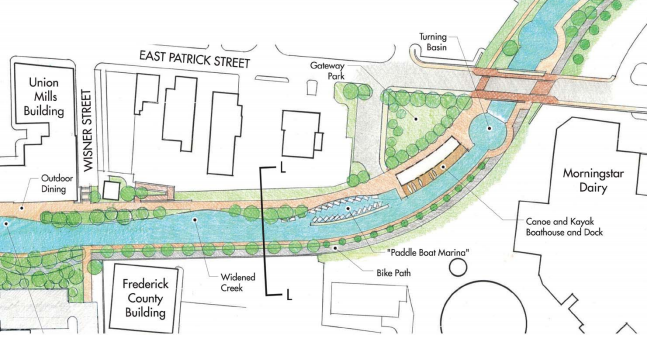 Note: All images were used with permission from the City of Frederick and are from two documents on the City’s website: 2003 Draft Park Plan (pdf) and 2008 Carroll Creek Park Briefing (pdf).